WIP Wednesday: Stitch, Snip ‘n’ Steek! This week, among starting some shiny new projects, I noticed something quite surprising- that the last few years of non-stop knitting have finally given me a choice of hand knit sweaters and cardigans to wear- woohoo! I no longer have just my 2 trusty aran sweaters to choose from, but lightweight cardigans, sweaters and wraps in different styles. Wearing the garments I have made myself makes me feel happy, especially when it reminds me of the different techniques I learned though a particular project. Sure, I might have a thread hanging out here and there or have wonky seams, but it’s all part of the charm! This week I finally took the plunge and steeked my Aftur sweater. 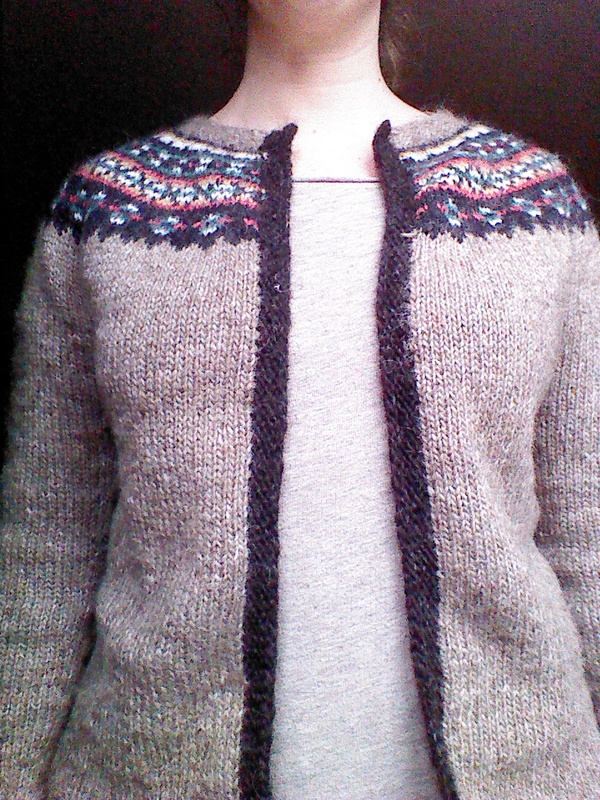 This was the first Icelandic sweater I knit, and I managed to knit it a little on the snug side. After aggressive blocking, I could wear it comfortably enough, but recently I have stopped wearing it and I realised I’d have to make it over or give it away to be loved by someone else. It was originally knit in the round without a steek in mind, but I found some instructions for converting a sweater to a cardi. 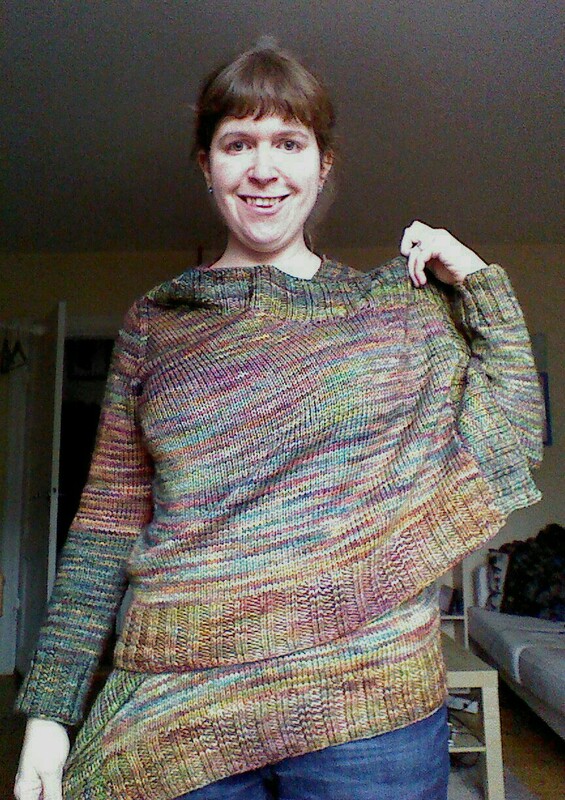 I hand sewed up either side of the center front and then- deep breath- CUT into my beloved sweater up the center. This is both a bit terrifying and quite satisfying :) I was surprised that my sweater didn’t immediately start unravelling of it’s own accord between my hands, which was just as well as I now needed to pick up stitches along my lines of sewing. 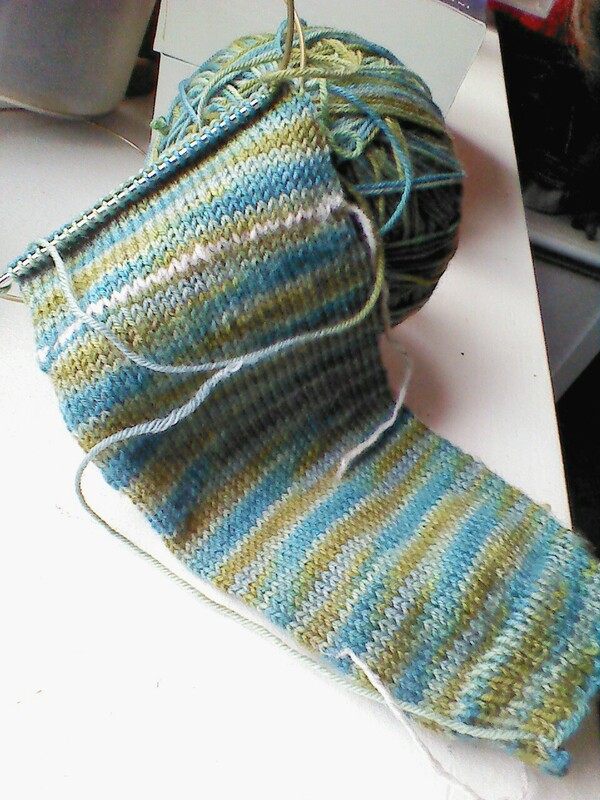 I used a bit of my leftover lopi to knit a few rows of garter stitch on each side before binding off. My “new” cardi now fits much better and I’ve been wearing it loads! I also cast on another pair of afterthought heel socks in my last skein of Lorna’s laces Shepherd Sock Multi in the “Huron” colourway. This a lovely turquoise-y, bluey, greeny combo on a base of 80% superwash merino and 20% nylon. The kind of yarn you want to rub against your cheek all day (though maybe not once attached to a foot). I’d been holding off starting the Flax sweater by Tin Can Knits as I was trying to be good and not cast on All The Things, but the yarn was sitting in it’s bag in the corner of the room tormenting me with it’s luscious green gorgeousness. Of course this led to me casting it on last night. 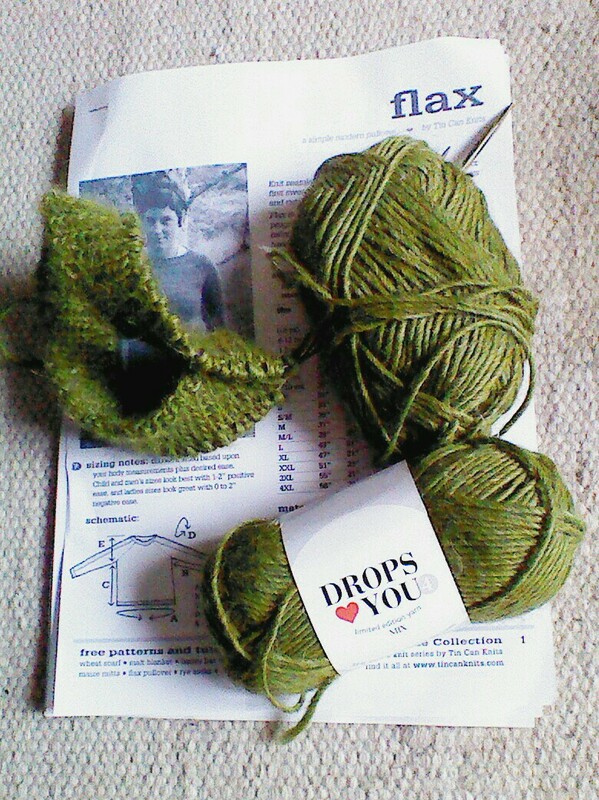 The yarn is Drops ♥ You mix no.4, a limited edition worsted weight yarn in colour 7238. It’s a soft blend of 55% alpaca, 40% wool and 5% linen. I was lucky to get enough in a recent sale so it worked out pretty cheap at 17DKR per 50g. I have heard from others that Flax is a great pattern- I love the garter stitch detailing on the sleeves, and it fits right into my “plain but pretty” knitting brief, for garments that I feel great in and will also be great for everyday wear. And finally- drumroll please!- I blocked the Effortless cardigan and I LOVE it! The pattern was fantastically simple and easy to follow, and the Malabrigo Rios yarn was a joy to knit with. The only thing I found was that although my skeins were of the same colourway and dye lot, they varied wildly in colour. Check out my right sleeve and you’ll see what I mean! This was my own fault though, as I didn’t do the recommended thing of alternating skeins, which helps hide any major contrast in hand dyed yarn. I’m still pleased with the result though, I’m thinking of it as my technicolour dream coat, and I love that I can wear it as a waterfall cardigan, or swooshed over my shoulder in a dramatic fashion (as illustrated). This entry was posted in WIP Wednesday and tagged Afterthought Heel, Aftur Sweater, Drops Yarn, Effortless Cardigan, Flax Sweater, Hannah Fettig, Håndarbejde, København, Knitting, Lorna's Laces, Malabrigo, Steeking, Strik, Tin Can Knits, WIP Wednesday. Bookmark the permalink. 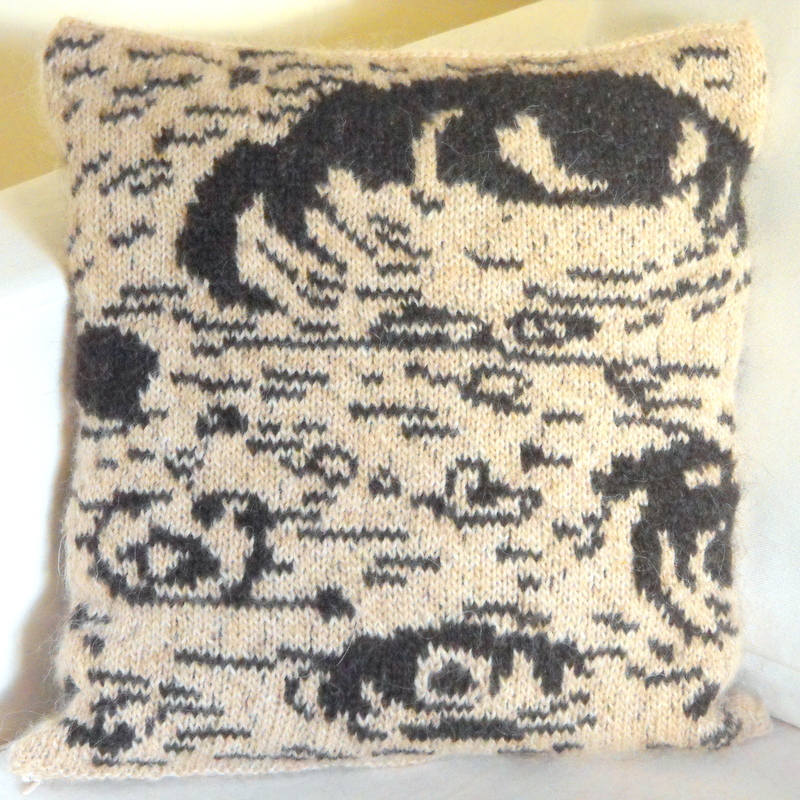 1 Response to WIP Wednesday: Stitch, Snip ‘n’ Steek! That Effortless sweater might have to go into my queue. Very nice!